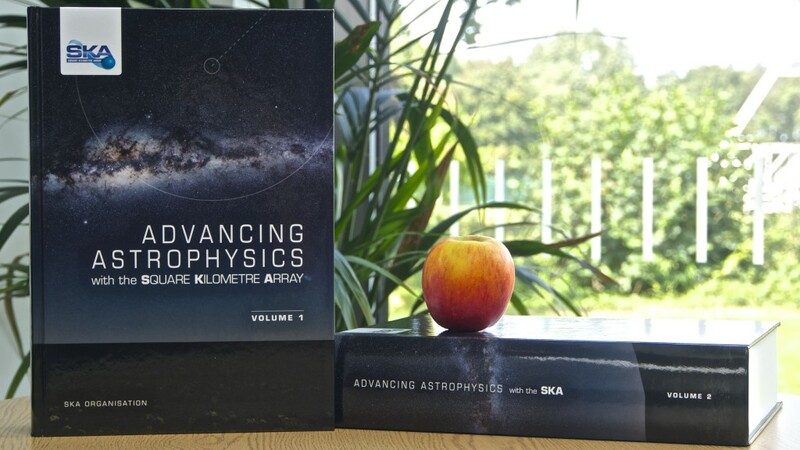 Wednesday 16 September 2015, SKA Organisation HQ – Today SKA Organisation is releasing the new official SKA science book, Advancing Astrophysics with the Square Kilometre Array. The book contains the proceedings from the SKA science conference held in Giardini Naxos, Sicily last year. The two-volume book contains 135 chapters written by 1,213 contributors from 31 nationalities, adding up to some 2000 pages covering many areas of astrophysics, from cosmology to the search for life in the Universe. The last SKA science book, Science with the Square Kilometre Array, was published in 2004. The chapters in the new SKA science book reflect the large breadth of science to be undertaken with the SKA, including among others, cosmology and the study of dark matter and dark energy; the search for life in the Universe through the study of molecules in forming planetary systems and the search for potential radio signals from intelligent civilisations; looking back at the cosmic dawn – the first billion years – of the Universe and the apparition of the first stars to study the distribution of hydrogen; mapping the thousands of pulsars in our galaxy; looking for gravitational waves and monitoring the sun’s activity, as well as synergies with other major astronomical facilities such as ALMA, ELTs, LSST, and supporting science from future space missions such as ESA’s Gaia and Euclid missions. A limited number of hard copies of the book will be distributed to scientific and governmental institutes. The electronic version in PDF format can be downloaded on the SKA website in the books section. Individual chapters are available for download on the Proceedings of Science website.